Go to original pattern for design DROPS 169-26. Crochet DROPS top with lace pattern and round yoke in ”Muskat”. The piece is worked top down. Size: S - XXXL. 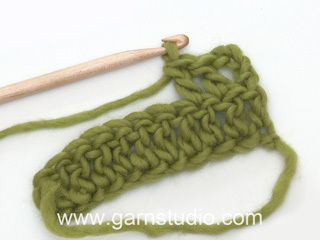 DROPS CROCHET HOOK SIZE 4 mm – or size needed to get 18 tr x 9 rows = 10 x 10 cm. 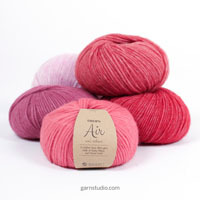 You can get the yarn to make this pattern from	12.80£. Read more. See diagrams A.1 to A.4. Diagram A.4 shows how round beg and ends. Replace first tr at beg of every tr round with 3 ch. Finish round with 1 sl st in 3rd ch at beg of round. Replace first dc at beg of every dc round with 1 ch. Finish every round with 1 sl st in ch from beg of round. Inc 1 tr by working 2 tr in same tr. Dec 1 tr by working 2 tr tog as follows: Work 1 tr but wait with last pull through (= 2 sts on hook), then work next tr but on last pull through, pull yarn through all 3 sts on hook. 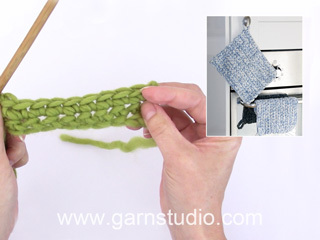 Size S, M and XL: In the last repeat of A.1 before marker 1 and marker 3 (= beginning of armhole), replace the last chain stitch with a treble crochet in the last stitch of the same repeat on previous row. The piece is worked top down. NOTE: It is important to keep the crochet tension vertically so that the measurements on yoke will be correct. Work 108-108-117-117-124-124 ch on hook size 4 mm with Muskat and form 1 ring with 1 sl st in first ch. Work first round as follows: Work 3 ch (= 1 tr) - READ CROCHET INFO, 1 tr in each of the next 3-3-5-5-5-5 ch, * skip 1 ch, 1 tr in each of the next 6 ch *, repeat from *-* the entire row = 94-94-102-102-108-108 tr. Work 1 round with 1 tr in every tr and inc 18-18-22-22-28-40 tr evenly - READ INCREASE TIP = 112-112-124-124-136-148 tr. Work next round and insert 8 markers in the piece as follows: A.4 shows how round beg and ends. Insert 1st marker at beg of round, work A.2 over the first 4 tr, insert 2nd marker, A.1 over the next 12 tr (= 2 times in width), insert 3rd marker, A.2 over the next 4 tr, insert 4th marker, work A.1 over the next 36-36-42-42-48-54 tr (= 6-6-7-7-8-9 times in width), insert 5th marker, A.2 over the next 4 tr, insert 6th marker, A.1 over the next 12 tr (= 2 times in width), insert 7th marker, A.2 over the next 4 tr, insert 8th marker, A.1 over the last 36-36-42-42-48-54 tr (= 6-6-7-7-8-9 times in width). REMEMBER THE CROCHET TENSION! Between 2nd and 3rd marker and 6th and 7th marker: Inc 0-0-6-6-6-6 tr (= 12-12-18-18-24-24 tr between these markers). Between 4th and 5th marker and 8th and 1st marker: Inc 0-6-6-6-6-6 tr (= 36-42-48-48-54-60 tr between each of these markers). Then repeat diagram A.1 2-2-3-3-4-4 times between 2nd and 3rd marker, 6-7-8-8-9-10 times between 4th and 5th marker, 2-2-3-3-4-4 times between 6th and 7th marker and 6-7-8-8-9-10 times between 8th and 1st marker. Work A.2 as before. Between 4th and 5th marker and 8th and 1st marker: Inc 6-6-6 tr (= 54-60-66 tr between each of these markers). 12-12-12 tr have been inc in total on round. Repeat A.1 9-10-11 times between 4th and 5th marker and between 8th and 1st marker. Repeat inc on 10th round in A.1 (= 60-66-72 tr between each of these markers). Repeat diagram A.1 10-11-12 times between 4th and 5th marker and between 8th and 1st marker. On last round in A.2 insert 1 new marker in the middle of each A.2 (i.e. 18 tr on each side of marker in A.2 = 4 markers). Remove the old markers (= 4 markers remain in piece). Sts between markers are for sleeves (= 48-48-54-54-60-60 tr on each sleeve). When A.2 has been worked 1 time vertically, there are 240-252-276-300-324-336 tr on round. Yoke is now done in size S.
Continue with pattern A.1 as before but over tr in A.2 (= 36 tr) work A.3 2 times in total in width (marker is in the middle of these repetitions). Work 1-2-3-4-5 rounds of A.3 (see arrow in diagram for correct size). Piece now measures 17-18-19-20-21-22 cm vertically. 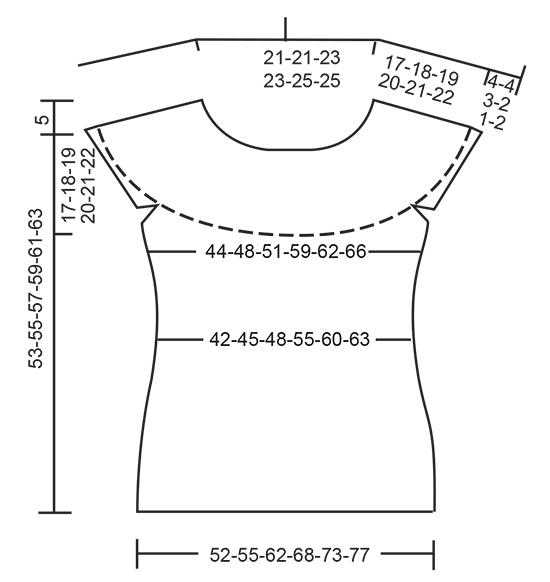 Work A.1a (see arrow on where pattern beg in the different sizes) 3 times in total in width until first marker – SEE ARMHOLE TIP, work 8-8-8-10-10-10 ch, skip sts between the 2 markers (= sleeve), work A.1a 12-13-14-16-17-18 times in total in width until next marker (= front piece), work 8-8-8-10-10-10 ch, skip sts between the 2 markers (= sleeve), work A.1a 9-10-11-13-14-15 times in total in width (= 160-172-184-212-224-236 sts). Fasten off. Work 1 sl st in 5th ch, 1 ch, work 1 dc in each of the next 3-3 ch, work A.1a as before until ch under 2nd sleeve, 1 dc in each of the 8-8 ch under sleeve, work A.1a as before the rest of round. Work the 8-8 sts under each sleeve as 1st st in A.1a. Work 1 sl st in 5th ch, 3 ch, work 1 tr in each of the next 3-5-5-5 ch, work A.1a as before until ch under 2nd sleeve, 1 tr in each of the 8-10-10-10 ch under sleeve, work A.1a as before the rest of round. Work the 8-10-10-10 sts under each sleeve as 1st st in A.1a. Insert 1 marker in piece, NOW MEASURE PIECE FROM HERE. On first round with tr dec 4-4-4-2-2-2 tr evenly - READ DECREASE TIP = 156-168-180-210-222-234 tr. Then repeat A.1a 26-28-30-35-37-39 times in width. Repeat A.1a vertically. When piece measures 12 cm, adjust so that next round is with tr, dec 6 tr evenly = 150-162-174-204-216-228 tr. Now repeat A.1a 25-27-29-34-36-38 times in width. Repeat dec when piece measures 16 cm from marker = 198 tr. Now repeat A.1a 33 times in width. When piece measures 20-21-22-23-24-25 cm from marker – adjust so that next round is with tr, inc 6 tr evenly. Repeat inc every 2-2-1½-1½-1½-1½ cm 5-5-7-7-7-7 more times = 186-198-222-246-264-276 tr. Repeat A.1a 1 more in width on every inc. When all inc are done, repeat A.1a 31-33-37-41-44-46 times in width. Work until piece measures 36-37-38-39-40-41 cm from marker, adjust to finish nicely according to pattern. Fasten off. Beg by working mid under sleeve as follows: Work 1 sl st in 4th ch of the 8 ch worked in armhole on body. Work 1 ch (= 1 dc). Then work with 1 dc in each of the next 4 ch, work A.3 over the next 18 tr, work A.1 (adjust pattern according to A.3) 2 times in total in width as before, work A.3 over the next 18 tr, finish with 1 dc in each of the last 3 ch. Work as 1st st in A.3 in the 8 sts under sleeve. On last round in A.3 dec 10 tr evenly = 46 tr. Beg by working mid under sleeve as follows: Work 1 sl st in 4th ch of the 8-10-10 ch worked in armhole on body. Work 3 ch (= 1 tr). Then work with 1 tr in each of the next 4-6-6 ch, work A.3 as before, work A.1 (adjust pattern according to A.3) 2-3-4 times in total in width as before, work A.3, finish with 1 tr in each of the last 3 ch. Work as 1st st in A.3 in the 8-10-10 sts under sleeve. On last round in A.3 dec 10 tr evenly = 46-54-60 tr. Beg by working mid under sleeve as follows: Work 1 sl st in 4th ch of the 8 ch worked in armhole on body. Work 1 ch (= 1 dc). Then work 1 dc in each of the next 4 ch, work A.3 as before, work A.1 (adjust pattern according to A.3) 3 times in total in width as before, work A.3, finish with 1 dc in each of the last 3 ch. Work as 1st st in A.3 in the 8 sts under sleeve. On last round in A.3 dec 10 tr evenly = 52 tr. Beg by working mid under sleeve as follows: Work 1 sl st in 4th ch of the 10 ch worked in armhole on body. Work 3 ch (= 1 tr). Then work 1 tr in each of the next 6 ch, work 1 tr in each of the 60 tr, finish with 1 tr in each of the last 3 ch. Work 1 tr in every tr and dec 10 tr evenly = 60 tr. Work * 1 dc in first/next tr, 1 ch, skip approx. 1 cm *, repeat from *-* around the entire sleeve. Fasten off. Work the other sleeve the same way. Crochet an edge around the neck. Beg mid back. Work * 1 dc in first/next tr, 3 ch, skip approx. 1 cm *, repeat from *-* around the entire neck. Make sure to avoid a tight neck edge, adjust to finish with 1 sl st in first ch. Fasten off. Voor de pas maat xxl xxxl toer 5 (toer met stokjes in a1??? Dat is geen toer met stokjes dat zijn toer 6 en 7. Verderop voor de maren vanaf xl, meerder op de 8e toer, toer met stokjes??? Ik lees in andere vragen dat de toer met * toer 1 is in a1. Nu zijn er sowieso maar 2 toeren met stokjes en dat zijn toer 6 en 7. Ik begrijp nu niet meer waar ik precies moet meerderen in stokjes toeren voor de grotere maten. 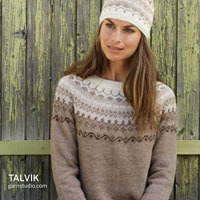 Hi For size XL is round/row 8 the one in pattern chart -treble/chain/treble in same space? Thanks. Dear Sue T, the 8th row in A.1 is for all sizes the same, ie the row after (tr,ch,tr in same ch-space) = the row where you have to crochet 3 tr around each chain from (tr, ch, tr on row below). Happy crocheting! Bonjour Mme Baaj, je pense voir ce que vous voulez dire, dans A.1 par ex vous avez: 1 bride, 2 mailles en l'air, 1 ms dans la bride, 2 mailles en l'air (= /\), 1 ms dans la mêm bride, 2 ml. Bon crochet! Bonjour,\r\n/\\\r\nxx\r\n\r\non voit ca dans les trois diagrammes ci dessus mais jai avance en ignorant les /\\: j\'accroche mes brides à la petite chainette du dessous . merci de m avoir lue ! 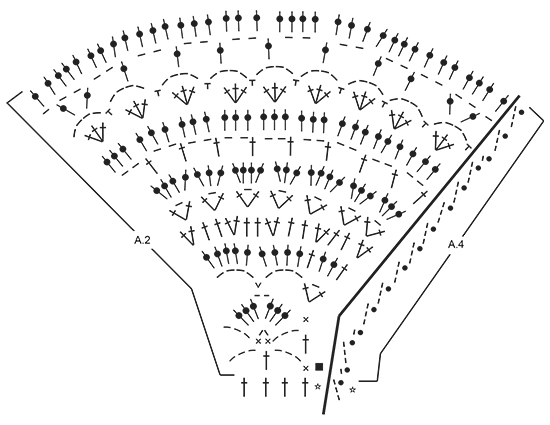 Bonjour, dans les diagrammes il ya parfois /\ quelle signification ? je ne crois pas avoir trouve dans le tutoriel.Je suis au rang 3 des diagrammes A et A2 ( premiere pelote de muskat).Merci de votre reponse . Bonjour Baaj, je ne trouve pas de symbole de ce type ppour ce modèle, pouvez-vous préciser votre question ou bien poser la question sur le modèle où vous l'avez repéré? Au rang 3 de A.2 on a en revanche un V avec un tiret en haut = 1 bride dans la ms, 1 ml, 1 bride dans la même ms. Le tout petit v = 1 ms autour de la ml. Bon crochet! Liebe Dorisa, ja genau, zwischen dem 4. und 5. Markierer und dem 8. und 1. Markierer werden 6 Stb zugenommen (= es sind nun je 42 Stb zwischen diesen Markierern). Dann häkeln Sie A.1 2 x zwischen dem 2. und 3. Markierer, 7 x zwischen dem 4. und 5. Markierer, 2 x zwischen dem 6. und 7. Markierer und 7 x zwischen dem 8. und 1. Markierer arb. A.2 wie zuvor (mit Zunahmen wie im Diagram) weiterhäkeln. Viel Spaß beim häkeln! At end of Sleeve Edge, under "All Sizes" isn't a ch 3 left out? - the same finishing as neck edge. Dear Mrs Carriere, there shouldn't be 3 chains but only 1 on sleeve edge - pattern has been edited, thank you. Happy crocheting! 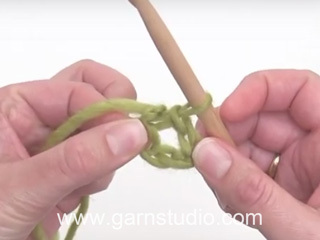 Bonjour Mme Baaj, tout à fait, les 8 m sous la manche vont se crocheter comme la 1ère m de A.3, soit alternativement 1 ms (= au 1er rang de la bordure de la manche) et 1 bride. Bon crochet! Bonjour Mme Baaj, vous avez bien 56 m pour la bordure de manche, crochetez: 1 ml (=1ère ms), 4 ms, A.3 (= 18 m), 2xA.1 (= 12 m) (crochetez le même rang de A.1 que pour A.3), A.3 (= 18 m), 3 ms = 1+4+18+12+18+3= 56 m. Au dernier tour de A.3, diminuez 10 m à intervalles réguliers = 46 m. Bon crochet! Bonjour! Il faut travailler: 1 ms dans la 1ère B, 3 ml, sauter environ 1 cm, *1 ms dans la B suivante, 3 ml, sauter environ 1 cm* répéter de *-* tout autour de l'encolure. Bon travail!